A new Gold Paladin from G-BT10 is revealed. AUTO (VC/RC) GB1 Unite: [Counter Blast 1] When this Unit’s attack hits a Vanguard, you can pay the cost. If you pay it, look at the top 4 cards of your Deck, Call 1 to (RC), shuffle your Deck, during that turn, that Unit gains Power+3000. • From the Character Booster “We Are!!! Trinity Dragon” (on sale January 13th, 2017), the cards included the SP Clan Packs. 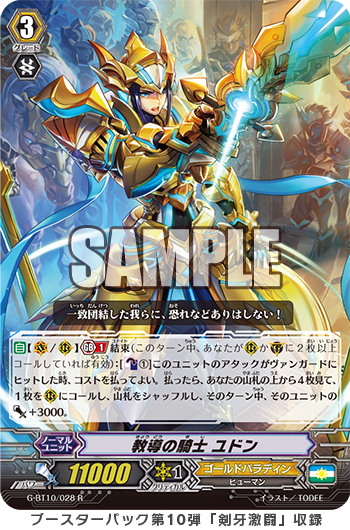 • From the 10th Booster Pack “剣牙激闘” (on sale February 3rd, 2017), 《Gold Paladin》’s “Knight of Instruction, Udon”. “We Are!!! Trinity Dragon” includes SP Clan Packs that contains 7 cards in beautiful foling that are vital cards of the same clan, all in 1 Pack! The 3 clans of 《Oracle Think Tank》, 《Dimension Police》 and 《Great Nature》, all have attractive cards that can immediately strengthen your Deck, so get your hands on one and add them to your Deck! Also, today, we’ll be introducing Deck Recipes from “We Are!!! Trinity Dragon”, so when you make your own Deck, use these as an example! And, for Today’s Card from 『剣牙激闘』 (on sale January 3rd): “Knight of Instruction, Udon”, when its attack hits a Vanguard while you’ve achieved 【Unite】, you can look at the top 4 cards of your Deck, Call 1 of them, and the Called Unit gains Power+3000. The ability to Call during the Battle Phase, means you can Attack with the Called Unit, allowing you to keep attacking again and again. 『剣牙激闘』 has many cards included that support 【Unite】, so you can expect it to see use. As well, “剣牙激闘” contains many cards that enhance existing Decks. So be sure to check out future updates!